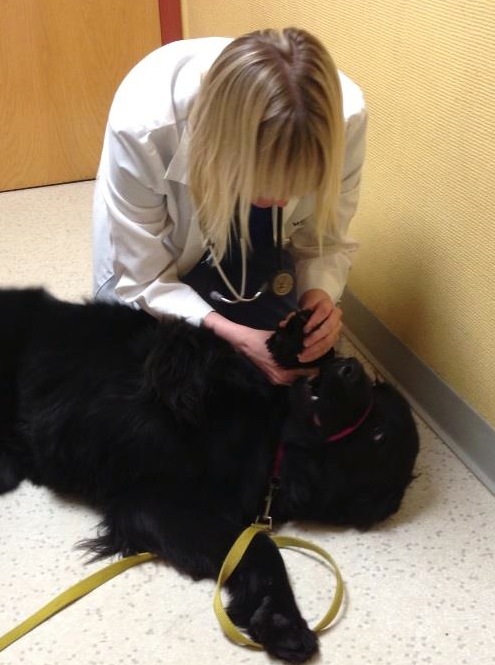 Miss Murphy the Newfie Goes to the Dogtor. We have this little neighbor dog, a pit bull/terrier something or other on whom her owners don’t exactly keep close tab. In fact, if she is acting up, the boyfriend owner justs kicks her out the door–and invariably, the girlfriend owner wanders the neighborhood looking for her, even though the dog will never come to her when she calls. Pretty sure that poor dog has been kicked around a bit, simply by the way it shies away from people. So even though she terrorizes the fenced up dogs in the neighborhood, you can’t help feeling sorry for her. You can see her good dog potential. Her name is Karma. The owners should have been more careful with her name, methinks. Anyway, she loves to play with Murphy. My husband sometimes lets her in the backyard with Murphy, and they have a grand time playing. Yesterday was such a day. He was working on the garage, and heard a yelp. He goes to investigate, thinking maybe Murphy sat on the little dog or something, but Murphy was the one limping. We have those yucky winter conditions right now: the snow has melted, been rained on, and refrozen. We think Murph slipped chasing Karma and hurt her paw. He made an appointment with the vet fot he next day. Murphy was limping significantly, plodding and favoring her left front paw. Newfs walk pretty heavy anyway; this felt like small earthquakes. Murphy loves the vet. She loves Dr. Lawson and Dr. Welle. We love Dr. Lawson and Dr. Welle. And they love Murphy. 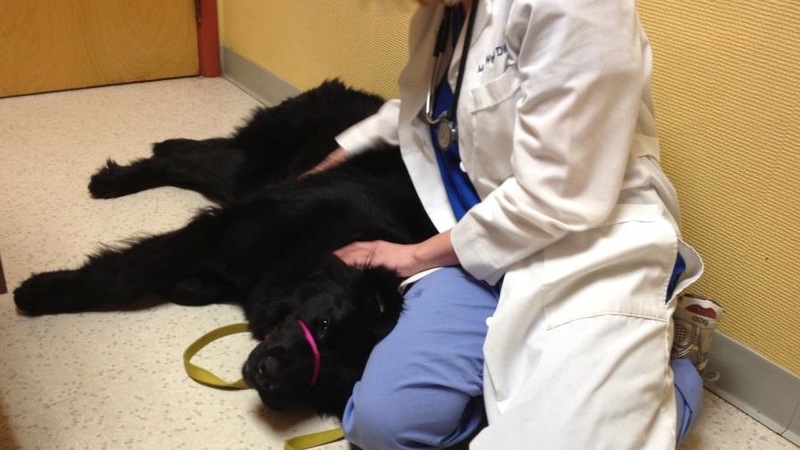 At 8 months and change, Murphy weighed in at 90.8 pounds. There were the usual exclamations about her size. She was very excited–she loves people and that makes her forget her manners. Today we get Dr. Welle. She is really amazing. She felt that Murph’s injury was a soft tissue one, and gave her a few days of Rimadyl. We didn’t want to take any chances, because big dogs can have so many problems with their legs. She gave Murphy a lot of love, said she was perfect, and was glad we weren’t trying to make her humungous like some large breed owners do–it is so bad for their joints. 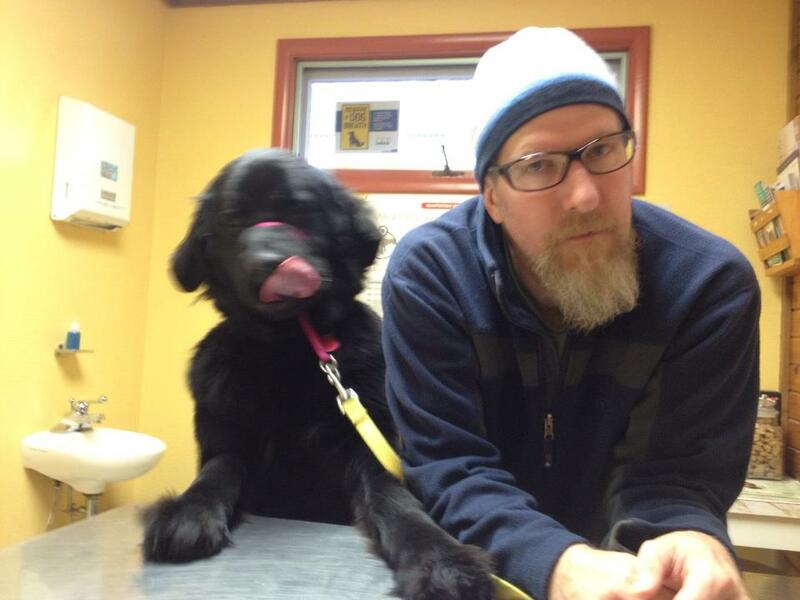 After shaving the mats behind her ears (Murphy isn’t terribly easy to groom–lots of biting the brush), she told us that while she was a crazy ginormous puppy, we were lucky because Newfies always settle down eventually. I gave Murphy a drink from the sink in the room (Dr. Welle thought that was a great trick!) and we went home. She’s a good puppy. 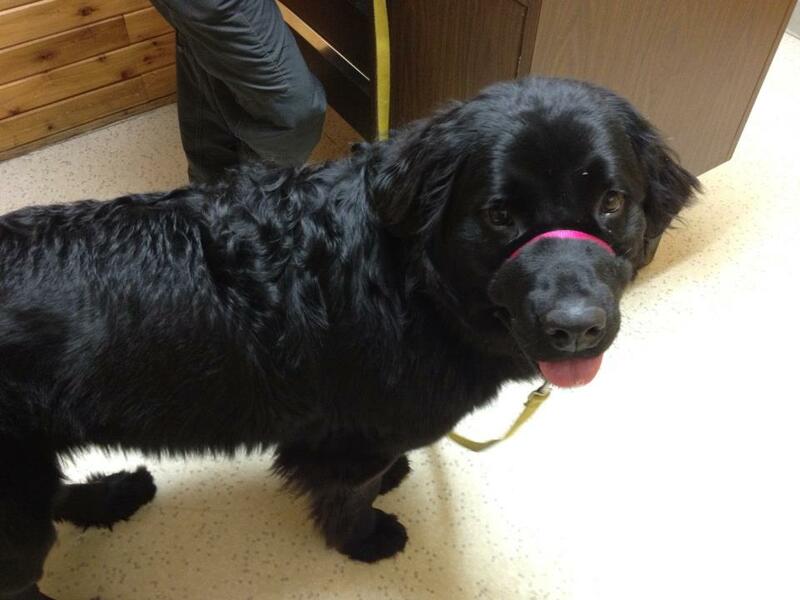 This entry was posted in The Newfoundland and tagged Glacier Animal Hospital, large breed, Murphy, Newfies, Newfoundlands, vet. Bookmark the permalink. It is so nice of you to give Karma some of Murphy’s love. I am glad she is not too hurt.